Discolored, chipped, or crooked teeth can make you feel self-conscious about the appearance of your smile. If that’s the case, it’s time to experience what Dr. Konopka’s artistic hand can do with beautiful porcelain veneers! The first thing you need to do is plan a consultation so we can discuss what you want to change about your smile. During the initial visit, Dr. Konopka will assess your teeth and discuss your needs and expectations with you, so you can make an educated decision about the next steps. With veneers, we cover the front of your teeth using a thin layer of porcelain. No whitening or braces are necessary. In just a couple of visits, you can have gorgeous new teeth that are the size, shape, and shade you prefer. 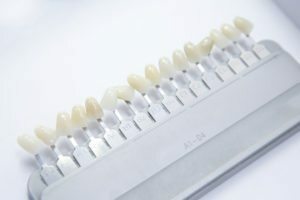 In order for your veneers to be bonded in place, we must slightly reshape the enamel. Dr. Konopka will anesthetize the area, so there is no discomfort. We then make an impression for our lab, where the overlay is created. In the meantime, a temporary acrylic overlay is bonded to the appropriate teeth, while the custom porcelain or Emax veneers are being created. One of the most exciting advancements in cosmetic dentistry in recent years is no-prep dental veneers or “Lumineers.” These ultra-thin overlays are made of silicate and fit on your teeth like contact lenses. They give you a luminous smile without removing your healthy tooth structure. If you ever need them removed, they can be taken off by Dr. Konopka at any time without ill effect to your teeth — making them entirely reversible. Since Lumineers are a “no-prep” treatment, the appointment is simpler than it would be for traditional veneers. No anesthetic or drilling is needed. Dr. Konopka will make an impression of your teeth and bite. Your natural, healthy teeth will remain, without being altered in shape. Like regular overlays, the impressions will be sent to our lab to create the custom fit that will make your smile more beautiful than ever. The type of veneer that you choose will depend on your own unique aesthetic concerns and natural tooth anatomy. Dr. Konopka’s eye for detail will take care of the rest. Lumineers work better for teeth that have minor discoloration or chipping; alignment issues or larger areas of damage are best served with traditional veneers. As one of the leading cosmetic dentists in Soquel, CA we focus more on your personal concerns for your smile. It’s only through this relationship that we can fully help you plan the best smile makeover possible. If you’re considering cosmetic dentistry or just want to learn what options may be available, make an appointment with Dr. Konopka today! We’re happy to assist you.